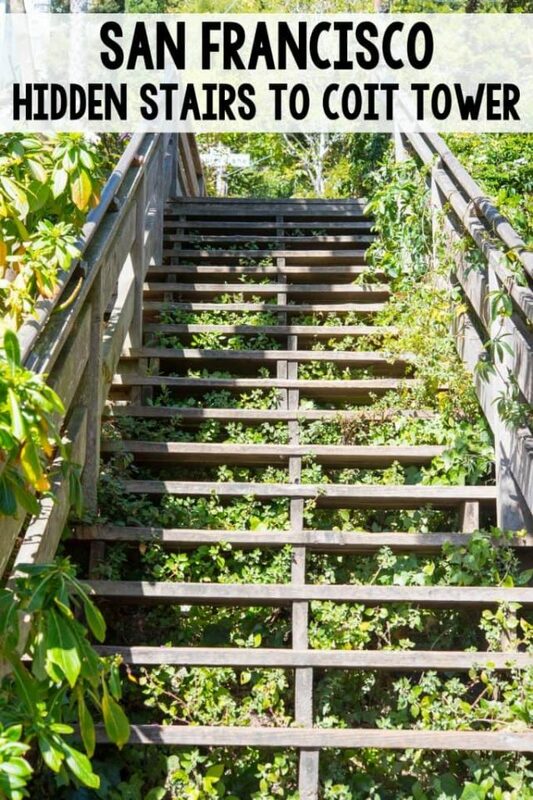 Take the hidden steps to Coit Tower for gorgeous views of San Francisco and a nice workout. See the hidden homes and great views of the San Francisco Bay! Even though I grew up in the San Francisco Bay Area, I never visited Coit Tower until I moved away. It’s one of those famous San Francisco skyline buildings you always see, but rarely think to visit (if you’re a local). One day we were looking for something to do on a day trip to the city and we discovered that there are hidden stairways all over San Francisco. If you’ve never been to the city by the bay, you’ve probably seen the steep hills on TV or online. Some of the streets have such an incline that I don’t even like driving or parking on them! 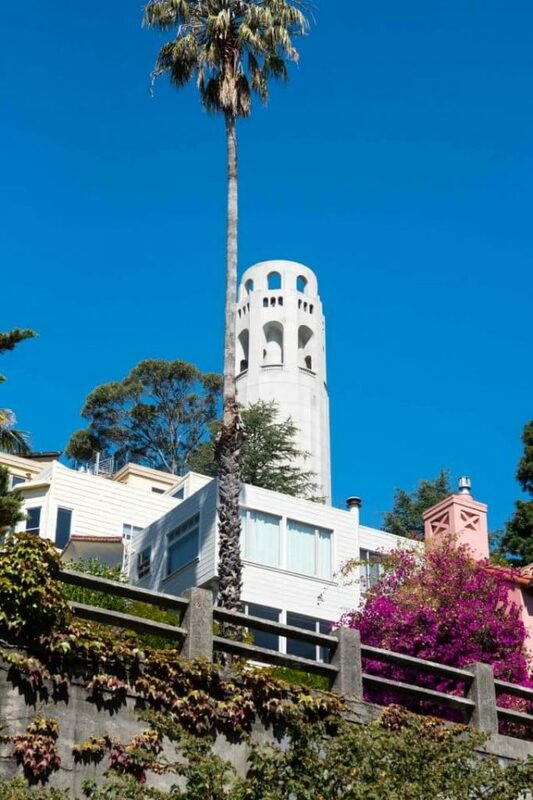 The result of these steep inclines are the amazing San Francisco Hidden Steps. There are several across the city, but my favorite are the hidden steps to Coit Tower. It’s a much better way to get to the tower (parking fills up at the museum) plus it’s more scenic, pretty, and calm. And it’s exercise! 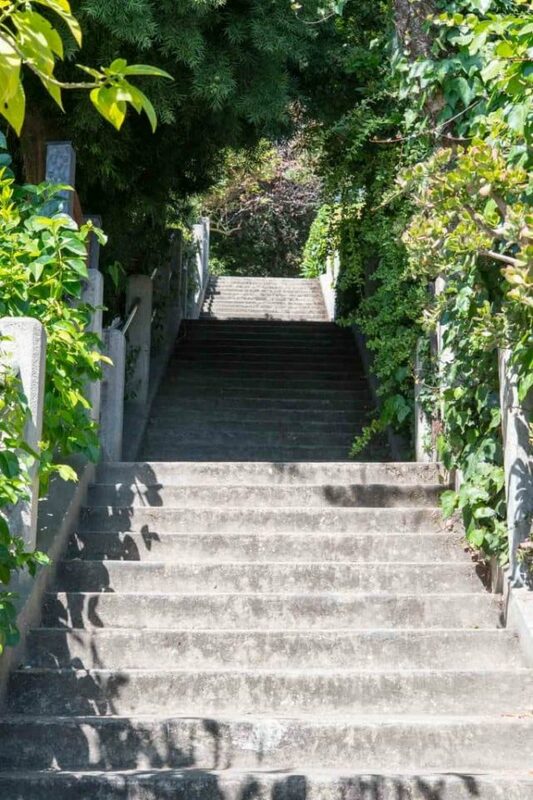 There are two sets of steps: the Filbert Street Steps and the Greenwich Stairs. We always go up the Filbert Stairs and walk back down the Greenwich ones, but you can do it either way. Lace up your walking shoes and let’s get started! 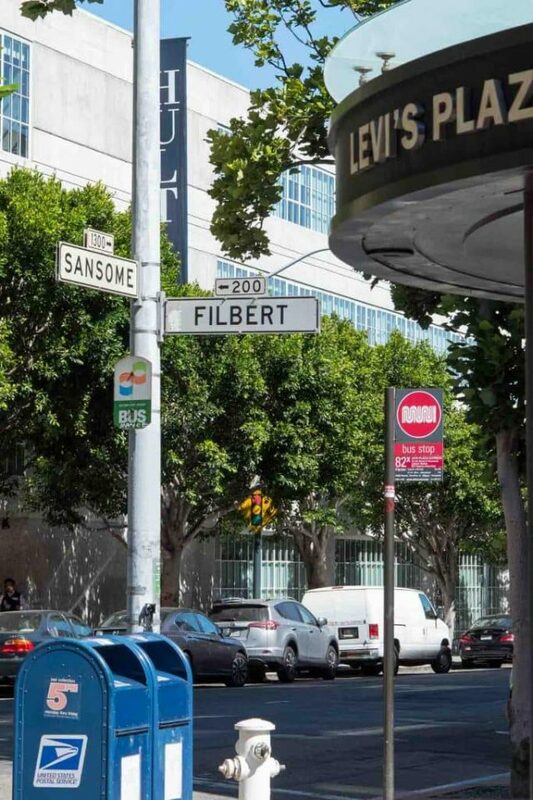 The stairs are visible right across the street from the intersection of Sansome and Filbert Streets. You’ll see some apartment buildings with a stairway between. Start climbing…but don’t forget to look behind you as you climb. The views of the Bay Bridge are stunning. Through the climb you’ll see yourself walking alongside homes and apartments. I think of these homes as hidden, just like the stairs. The only way in or out are up and down the staircases. Can you imagine being the UPS man? Or moving in and having to get your furniture into your flat? Some of the hidden steps to Coit Tower are wooden, some metal, and some are concrete. If you climb up or down the Greenwich steps, they’ve got designs on them and are super pretty. The stairs take you right to the back of the Coit Tower monument. 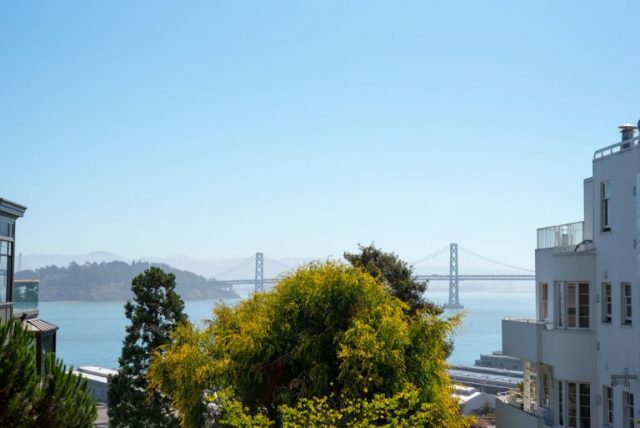 From here you can walk all the way around the tower and see 360° views of San Francisco, or you can take the elevator to the top and see the city from high above Telegraph Hill. Tip: go during the week to avoid the largest crowds. 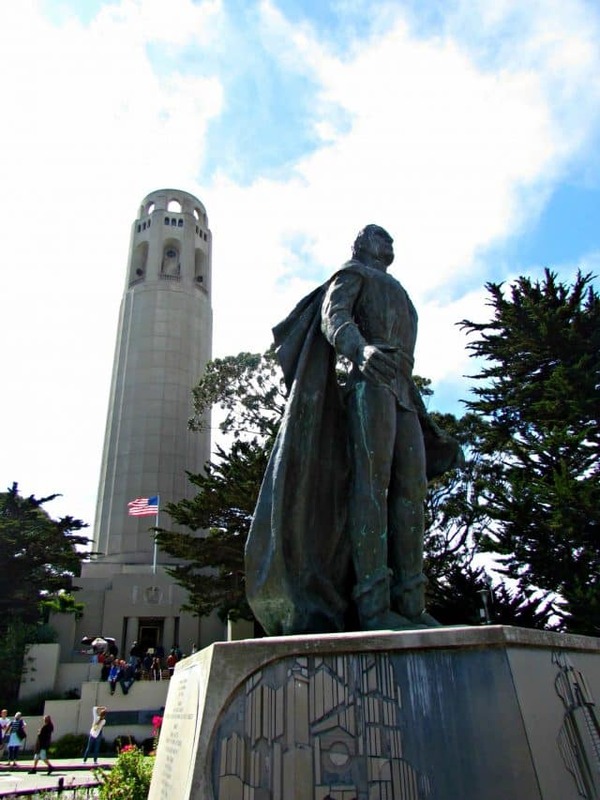 Climbing the hidden steps to Coit Tower is one of our favorite things to do in San Francisco. It doesn’t take very long to do, doubles as exercise, and is a great way to see the city. Plus, the kids love it! Great for kids and adults, is a quick thing to do before lunch or in the afternoon to tire them out. Just be sure an adult watches the kids at all times on the stairs. This is a great lunch break sight if you’re close to the area on business. A great way to get in a quick workout and see some sights at the same time. Parking is available for a fee at Levi’s Plaza Garage, right next to the steps. Street parking (with parking meters) can also be found if you’re lucky. Traveling to San Francisco? Be sure to visit the Ferry Building, Half Moon Bay and Napa! And don’t forget about Ghiradelli chocolate!